This year we really wanted to come up with something unique for the girls and since I've been working so hard on getting their playroom in order we decided to make a Cupcake/Bakery Stand that can be another element in their playroom. 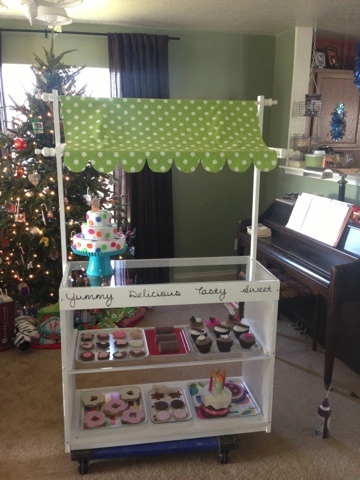 So, consider this Playroom Transformation #2: Cupcake Stand. I found a picture that I have to give credit to for our entire inspiration, but I can't seem to find it at the moment (I will keep looking). I tried to contact them to get any plans but never heard a response. So, we started the awesome process of exploring and planning things out on our own. Keep in mind: we know NOTHING about making any kind of wood projects (with the exception of our Kitchen Tower). So you could call us less than novices. But still, here's what we did. I'm sure those of you gifted enough would come up with a much more accurate way of doing things. 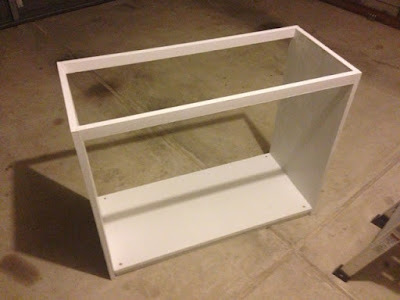 You'll start by mounting the bottom beam underneath the bottom shelf, to lift up the entire bottom shelf off the ground. 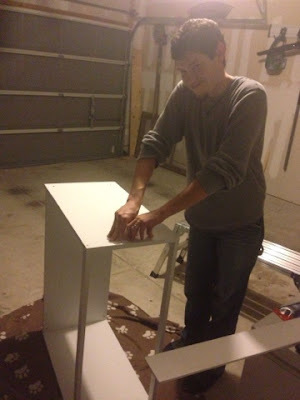 Here you can see my husband pre-drilling the holes and also setting them below the surface just a bit so not fingers will slide across and get scratched. 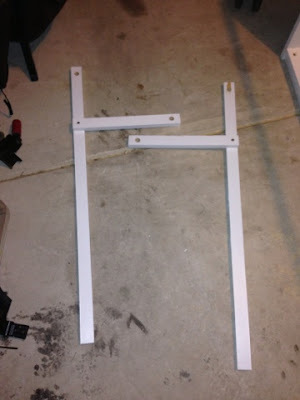 Next, you need to mount on the two side pieces. 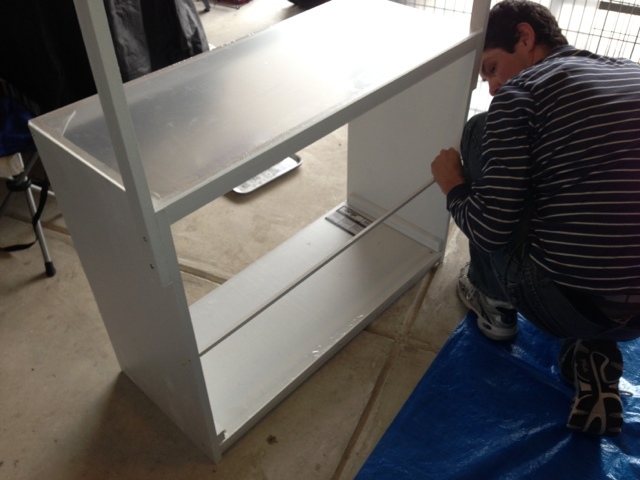 Make sure you check with a level on top so you don't get crooked sides. Then you want to screw on the top two beams, which will become the supports for the plexiglass on the countertop. To do this we flipped it on it's side and one supported the side and beams so they wouldn't move while the other screwed it in. 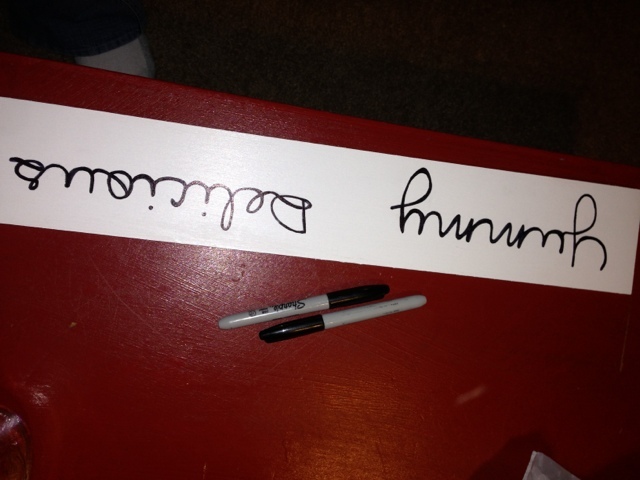 Then flipped it and did it on the other side. Next, you will prepare the beams for the canopy. 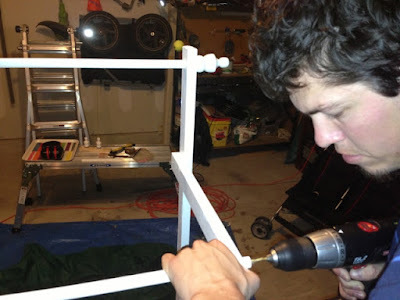 But before screwing together we made the holes on the two long canopy beams and two short canopy arms where the two dowel rods will go through. 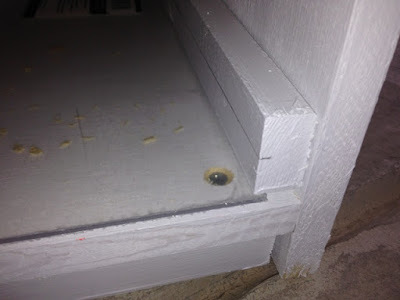 My husband did a 5/8 inch hole and then just jiggled it a bit at the end of screwing to open it just a smidgen more so our 5/8inch dowels will fit through. Then attach the short arm off the main canopy beam. Then measure the canopy beams. Meaning, how far down the side you want them to go. I figured the more the better. 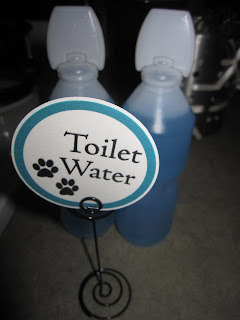 It will just give it better reinforcement. We did 9 inches from the top. We used two screws to attach them. 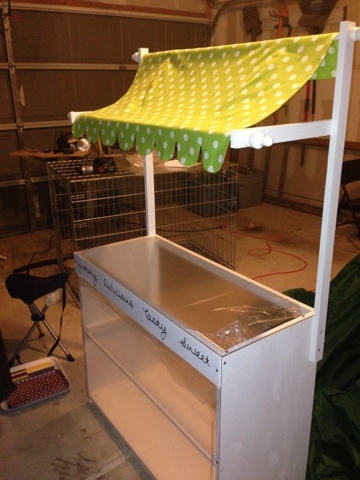 Once attached you can place the dowel rods through. 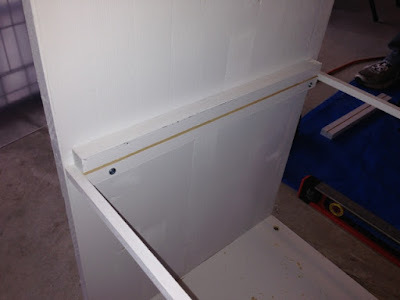 After your dowel rods are in place you can measure where you want them cut. I wanted them almost butted up to the edge. 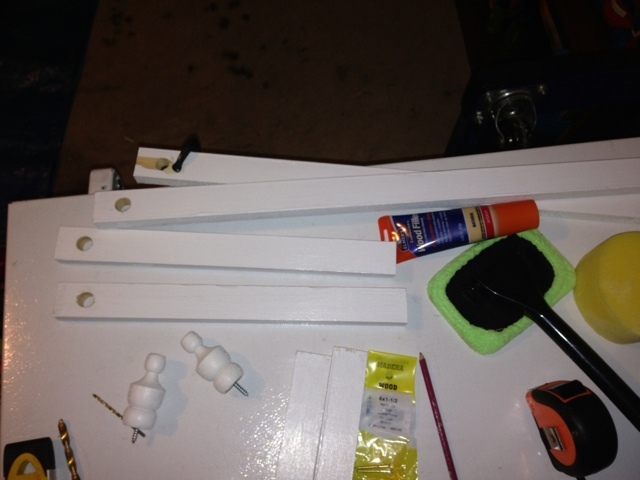 Then predrill the dowels and add your wooden knob on the ends. 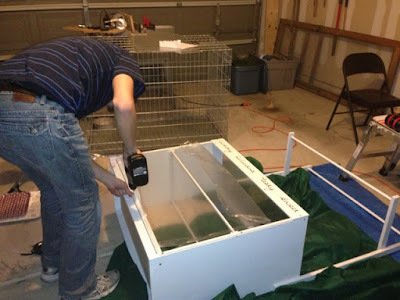 Next, we measured what panels we needed in plexiglass. 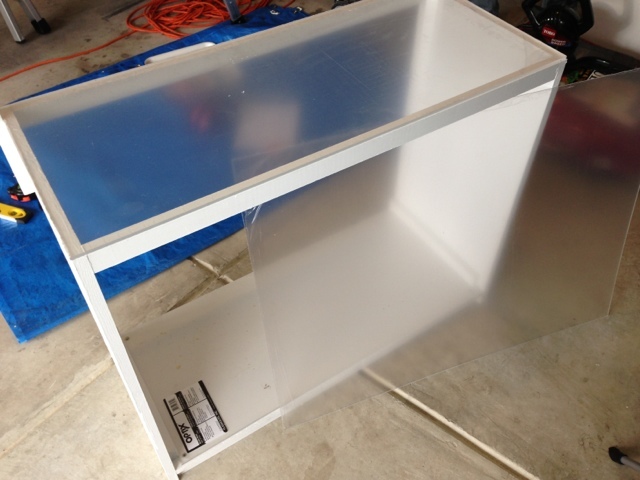 Went to Ace Hardware for some of the custom sizes and went to Lowe's to get some of the thinner plexiglass where we could get a couple pieces cut from one large size there. After we had our plexiglass we set the shelf inside to see if it fit. 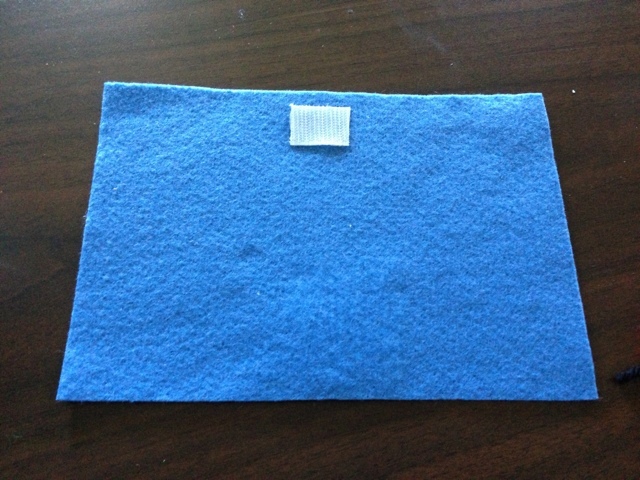 It actually ended up being a bit on the small size (so much for perfect measuring and cutting). So we set what was going to be our side beam on top of it against the side. That way we could see how deep we needed to cut the slit on the side beam. I marked the depth with a pencil. 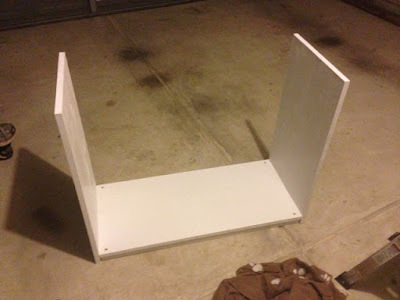 I say the shelf was a bit small because I really would have liked this depth to be much more. After Ryan cut the depth out of the side beams. 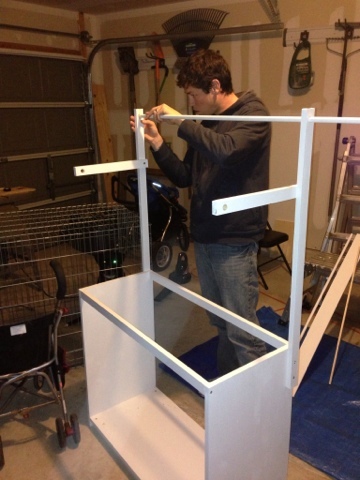 He attached one of the small thin supports for the middle shelf (make sure to predrill this little sucker), then the side beams with the slits, followed by the last thin support. It's hard to tell from the pictures but the shelf slides through the slits the side beams but also needs support to keep it from bowing so it just rests on top of the thin support beams. So make sure when lining all of this up that the thin beams are just below the slit on the side beam. Here it is with the shelf in it. After that, I worked on creating the front decorative piece. 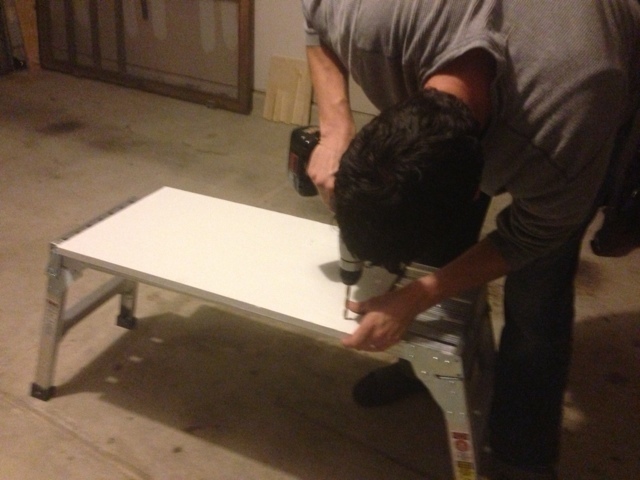 Then Ryan screwed on the top and front plexiglass. As well as the decorative piece over the front. Finally! All done (but we left the shrink wrap on the shelf to keep them as clean as possible up until the big reveal). 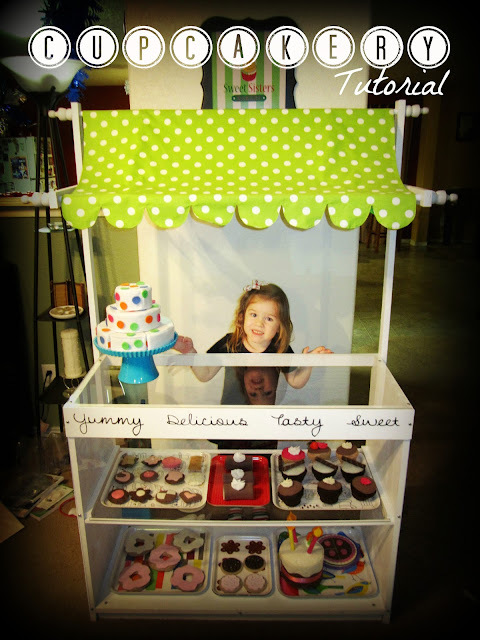 I just whipped up a quick canopy by putting scallops on one end and putting ties on the back side along two points on each dowel rod. Not very sophisticated but I'm still a beginner sewer, so I'm still pretty impressed with myself. I got my felt on and sewed up a storm: cupcakes, cookies, strawberries, whipped topping, swiss rolls, donuts and cakes. 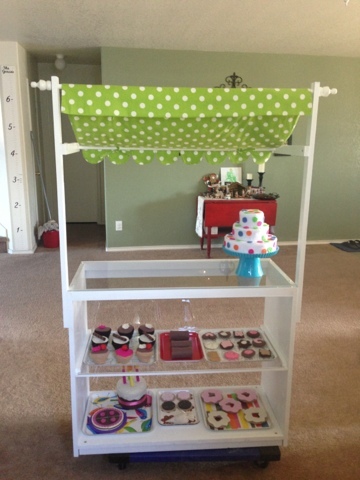 I also added some of her wooden cookies and cake to help fill up the space. 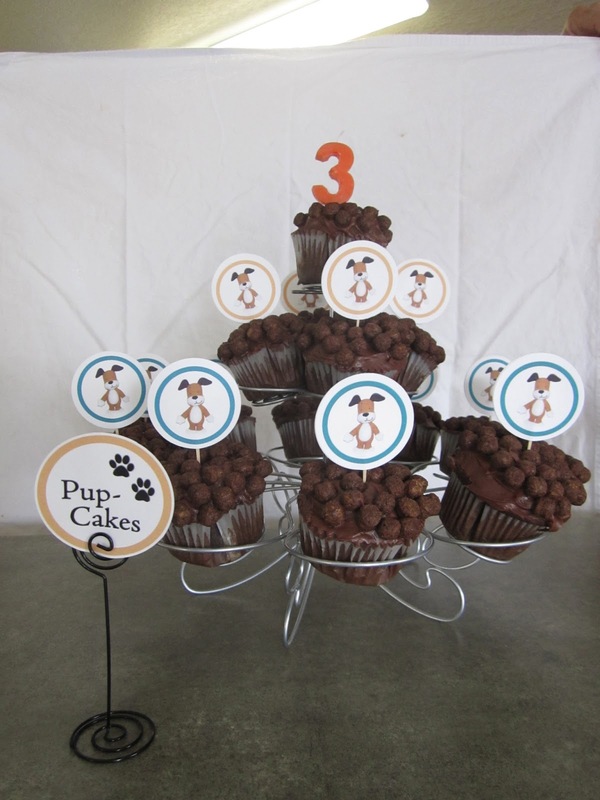 The 3-tier cake is my favorite. It comes with 4 candles that are removable, and the bottom tier slices are removable and have lemon, orange or strawberry filling. The cake also comes with polka dots, hearts or stripes, so she can change up her decorating during the year. 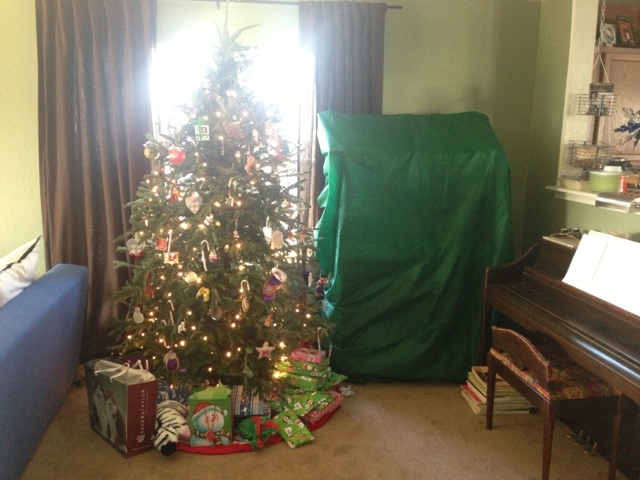 Here is the whole thing all set up on a roller, ready to be wheeled by the tree. 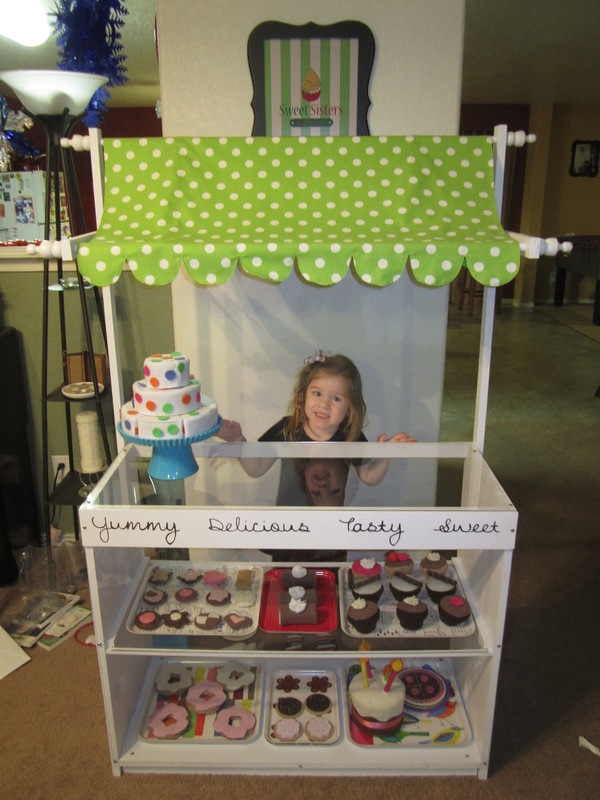 And here is one of our girls in the Sweet Sisters Bakery. You can vaguely see the bakery sign in the background. The green ended up not matching exactly but I was eyeballing it and made it way ahead of time just to make sure we'd have it for Christmas. 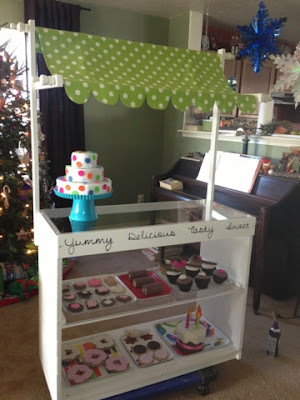 We had her open the picture frame first...and then said, "Man, you really need a bakery to go with that sign." All in all we had a very fun time making all of this and have loved to watch our girls and friends have so much fun. Makes all our hard work worth it. Look out for some more detailed posts of all the felt food I created. Especially our awesome 3-tier cake that comes apart in slices with filling in the middle. Blessings to your family and happy crafting! 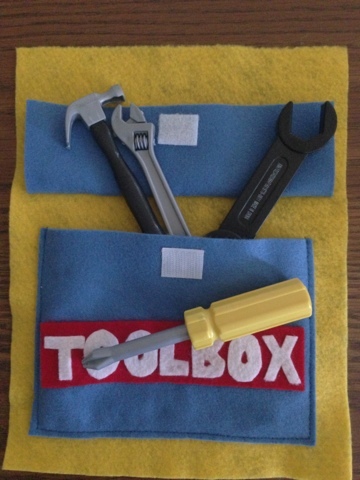 Around Halloween last year I found some cute plastic tools for a construction costume in the Target dollar section. I got three, just in case I could come up with something. Well, I finally did about a year later. 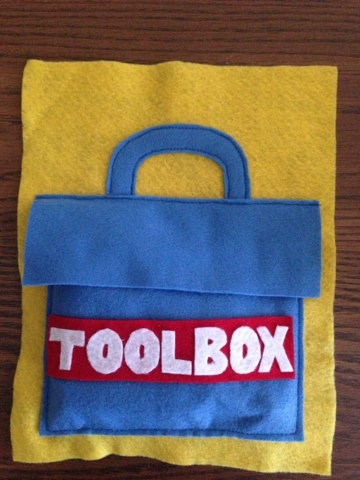 Here's what the final toolbox page looks like. I think I might work on making a wood beam box that has some pretend pieces for her to hammer together or something. But first things first. Here's the quick tutorial. 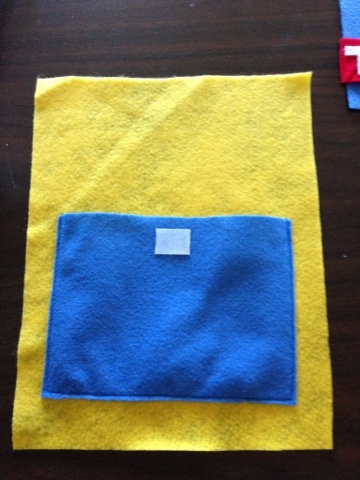 First you need to cut the main rectangle and glue or sew on one half of the Velcro. 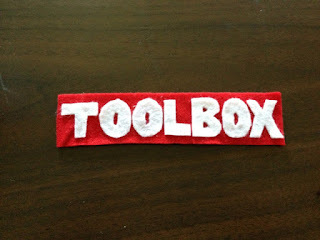 Next cut out the red strip that will fit on the box, along with the 'TOOLBOX' letters. Glue them on. 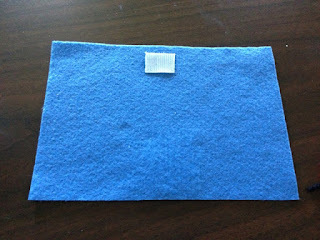 Sew on the main rectangle, after the Velcro dried on it. 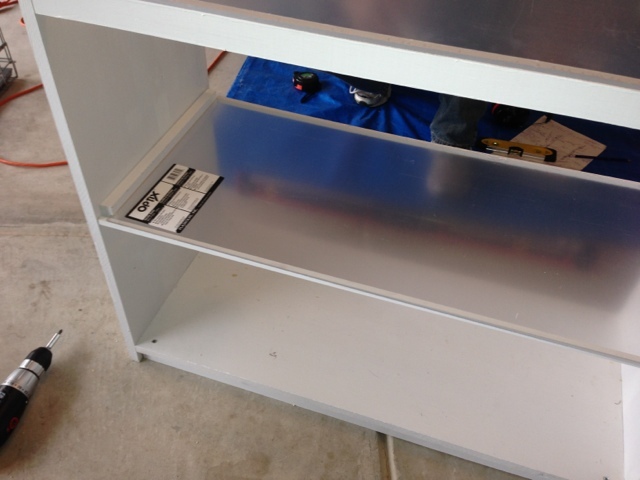 Now, cut out the long thin blue strip for the top of the toolbox, along with the handle. Then pin everything where it should go. 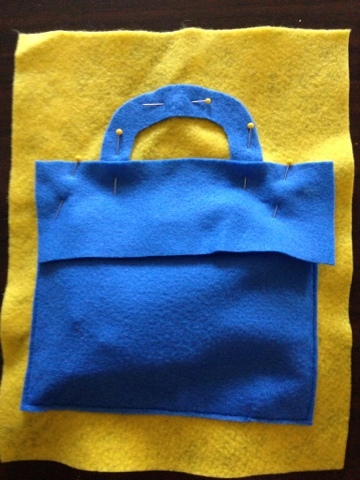 But sew the handle on first, then the lid next. 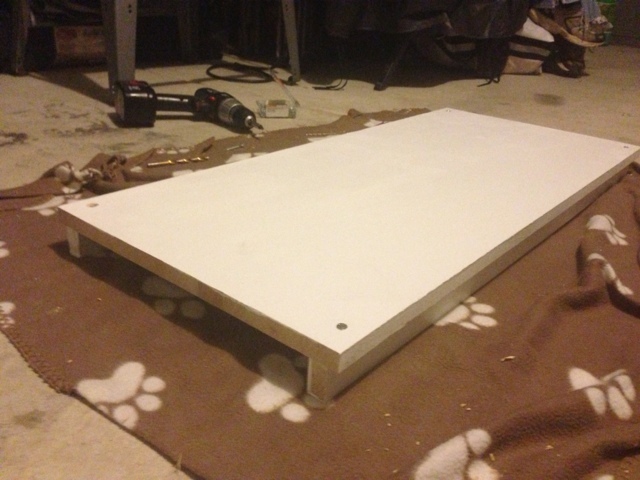 Now, glue the other half of the velcro onto the underside of the lid, making sure to line everything up. and last but not least, glue on the toolbox word to the top. Then stuff it with your tools and let your kids enjoy! 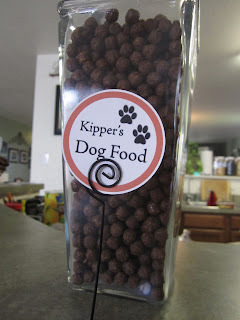 Kara has loved Kipper the Dog, the British Cartoon, ever since she started watching TV. So, not much to my surprise, she wanted to have a Kipper the Dog Birthday Party when she turned 3 years old. Right away I agreed and was actually really excited because Kipper is such a wonderful, simple, slow-paced show (compared to most nowadays). Only problem is, come to find out when searching for ideas, there aren't really any ideas because its a show from over seas so nothing is really sold here in the US. So, I started my manhunt for anything even remotely relating to Kipper or dog themed and here's what we ended up with. 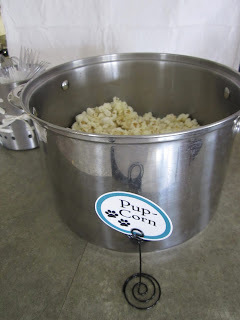 I had many compliments that this was the cutest idea for a party ever. I ended up creating the graphics myself in photoshop because there was nothing out there. 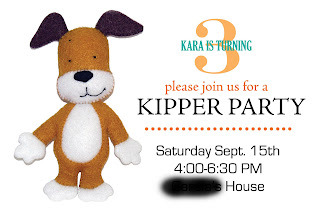 The main idea for the party was Kipper's Adoption Center. 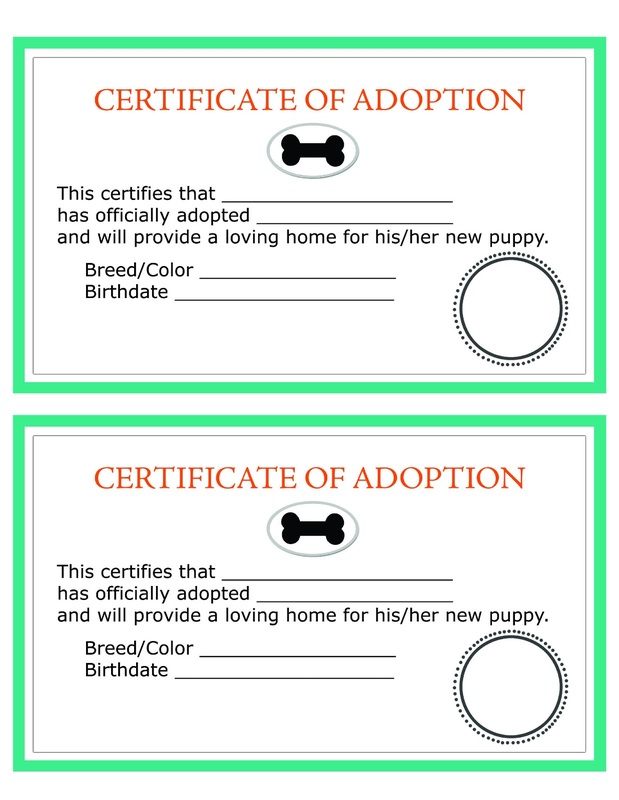 The adoption papers were more teal, not neon green. Not sure what happened when I saved them as a jpeg. I just need to adjust my color settings for the future. 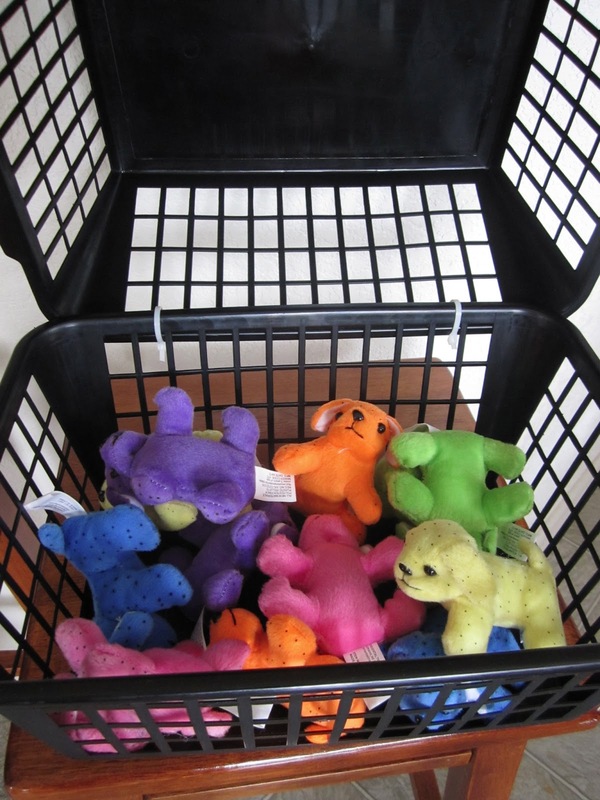 We bought small dogs off of oriental trading and each child came up, picked a dog from the pound. 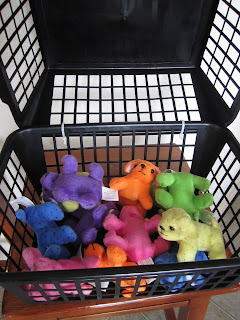 We had leashes of yarn on each of them. We asked the kids to think of a name. 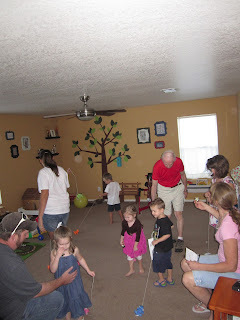 Then we went around the room and they introduced their dogs. Then we proceeded with puppy obedience training. 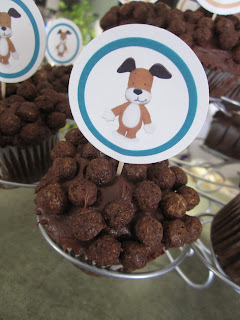 We had them teach their dogs to sit, roll over, play fetch, speak and many more. Then we had a quick performance. Where each child took a turn and showed the one trick that their dog could do best. 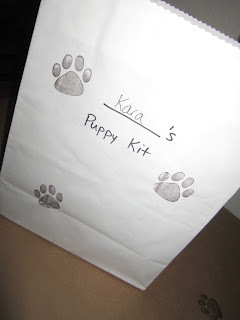 Then, now being competent owners and proving they could care and train their puppy, they got to go over to Kippers Adoption Center and officially adopt their new puppy and got a New Puppy Take Home Kit. 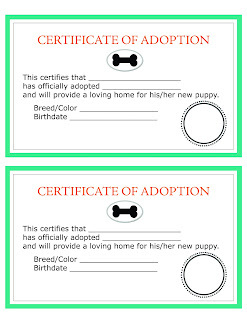 I created the adoption papers and the kids put their dog print (dog stamp) on the official document. 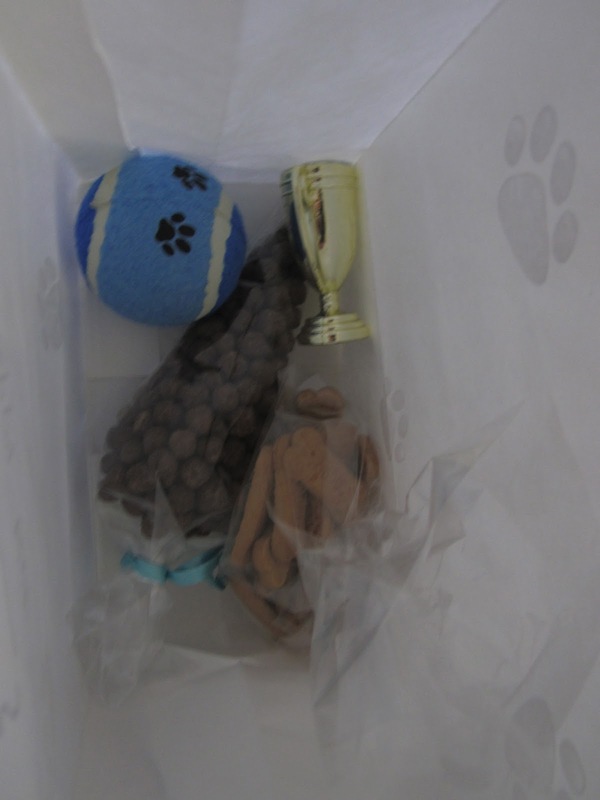 In their kit was a doggy tennis ball (Dollar Tree), bag of dog treats (scooby snacks), and then they can also put their trophy, certificate and dog in their. We had such a fun time. I'd definitely call this party a success. :). Happy Birthday my sweet girl. I can't believe you're three years old.